Please refer to our stock # 1-0621 when inquiring. 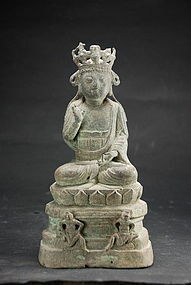 Rare and unusual statue of Vairocana Buddha, wearing diadem and monk's robes, sitting on an elevated lotus throne, his right hand in "abhaya mudra", his left hand resting on his lap, in didactic gesture. The front bottom side of the throne shows two small assistants (maybe Buddha's two companions, Ananda and Kasyapa) in relief, sitting in "regal repose". The back of the throne is incised with a long inscription (datation). Bronze, with fine encrusted green patina. China, early Ming Dynasty, probably earlier (Yuan). Height: 8 1/2" (22 cm). Small accident at the diadem and the right hand, otherwise very good condition.